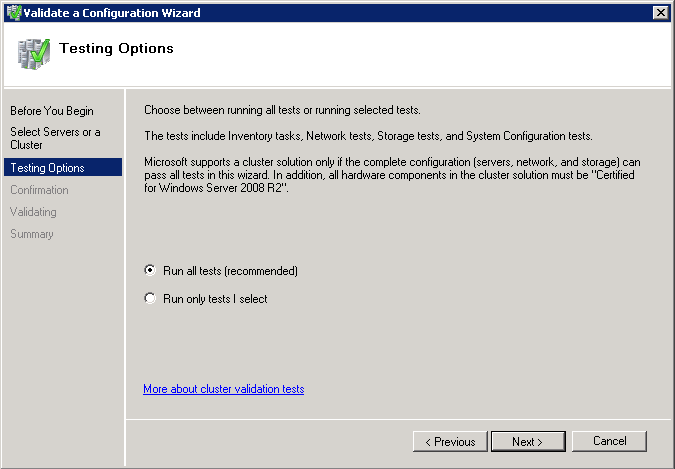 安裝 windows 2008 r2 failover clustering. 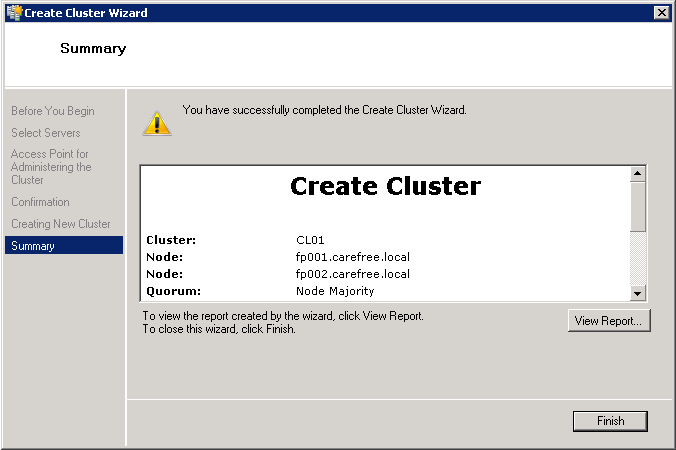 建立 two node failover cluster. 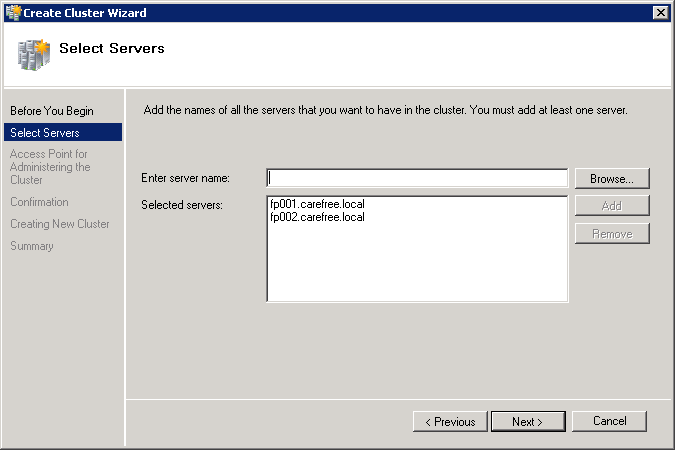 安裝 windows 2008 r2 failover clustering service. 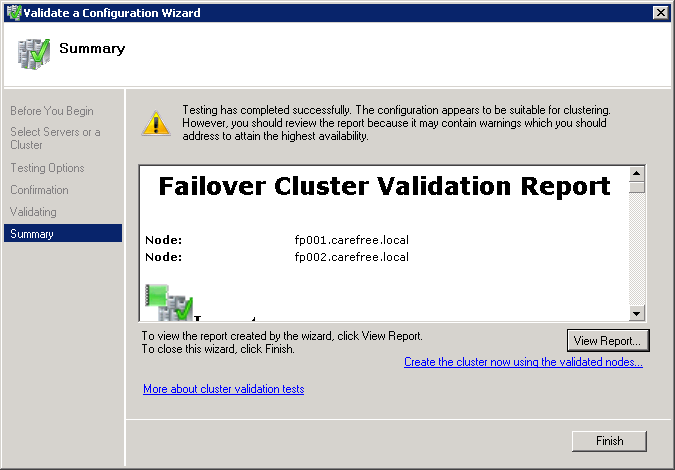 新增功能內, 勾選 failover clustering, 點 next. 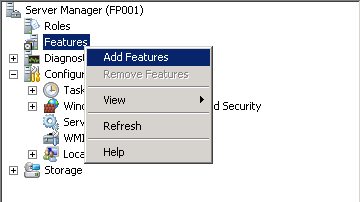 最後我們能在 server manager --> features 下看到 failover cluster manager 已經被安裝. 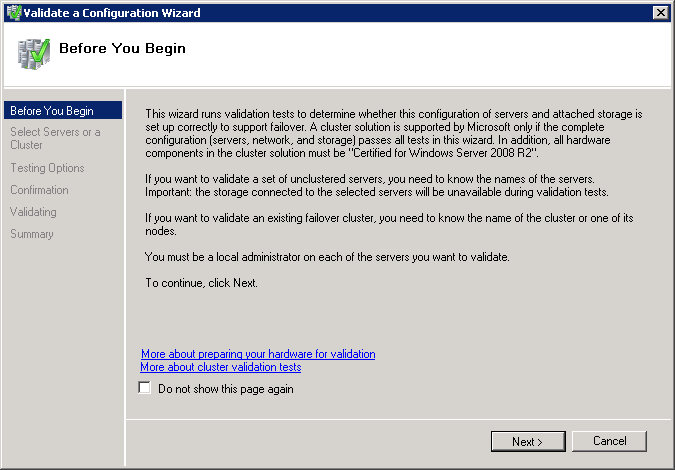 failover cluster manager 主要的用途在於管理 windows 2008 r2 的 failover clustering. 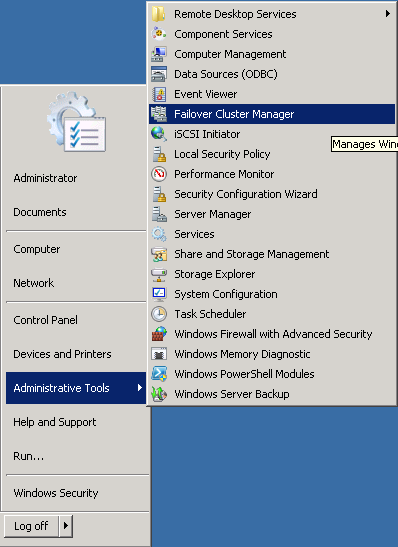 我們也能在 administrative tools 內看到 failover cluster manger. 在完成 fp001 的安裝後, 同樣的步驟也必須在 fp002 重複進行一次, 也就是說, 所有的結點伺服器都必須先安裝 failover clustering 功能. 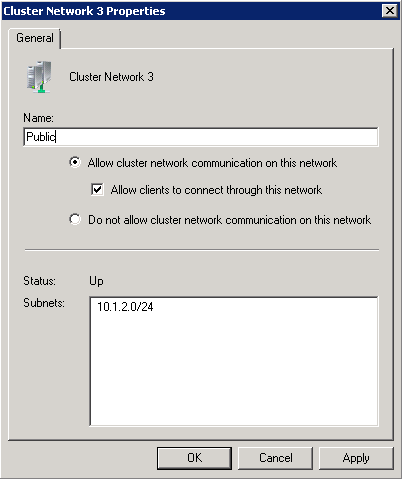 在所有的結點伺服器都安裝完 failover clustering 功能後, 接下來就準備建立 two node cluster. 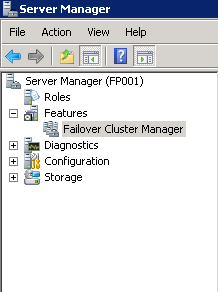 登入 fp001, 並在 administrative tools 內執行 failover cluster manager. 在建立 cluster 之前, 要先對我們所準備的環境進行驗證, 看看是否有不符合 cluster 的設定, 點一下 validate a configuration. 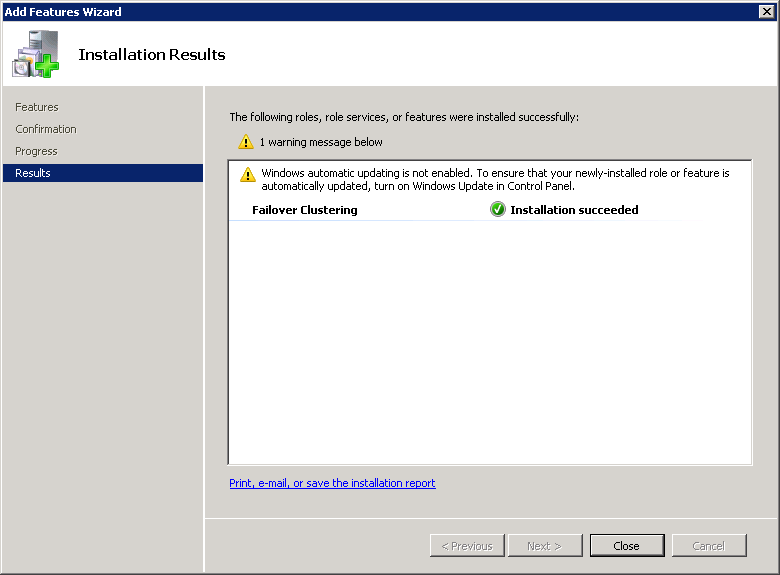 接下來加入要進行驗證的結點, fp001, fp002 後點 next. 在測試項目, 選擇 run all tests, 點 next. 在完成所有驗證後, 可以點 view report 來檢視是否有不適合 cluster 環境的設定. 檢視報告, 在檢視報告中, 可以看到儲存裝置似乎有點問題, 我們可以點一下儲存裝置項目看一下哪邊出了問題並點一下 finish 結束精靈. 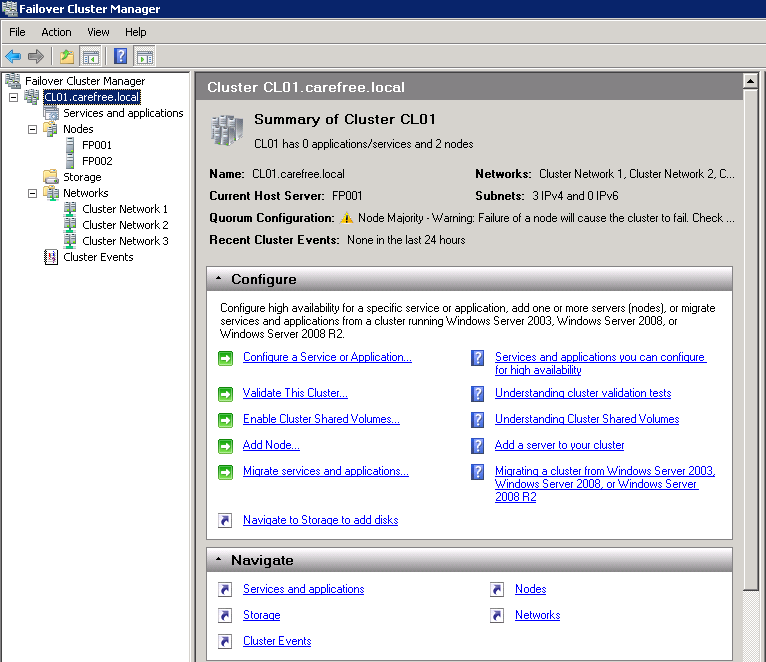 從詳細報告中, 我們能知道主要造成問題的原因都在於 cluster service 無法驗證共用磁碟機, 由於我們尚未將共用的磁碟機在節點伺服器上進行初始化, 所以出現問題是正常的, 由於驗證的結果只是警告, 所以還是能夠進行 clustering service 的設定. 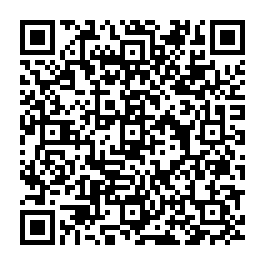 在建立叢集管理存取點視窗內, 填入 cl01, 並填入適當的 ip (10.1.2.9, 如前一篇所述) 並點一下 next. 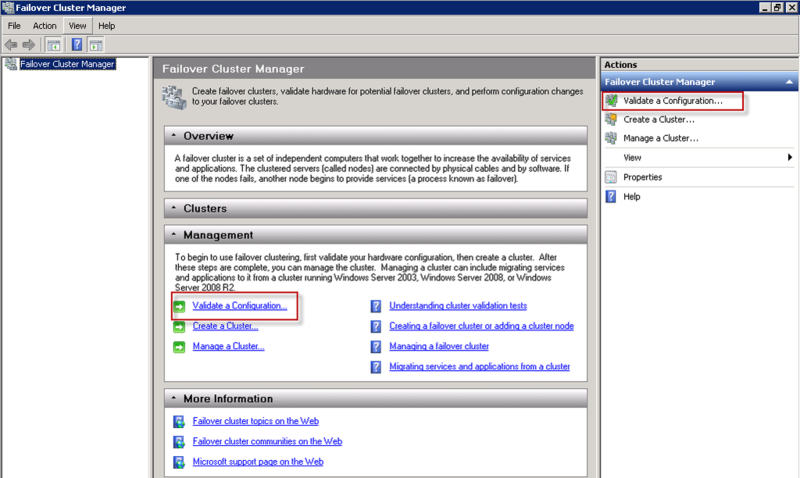 回到 failover cluster manager, 可以清楚的看到, 名為 cl01 的cluster 已經建立, 包含了兩個節點伺服器, 三個 cluster 網路. 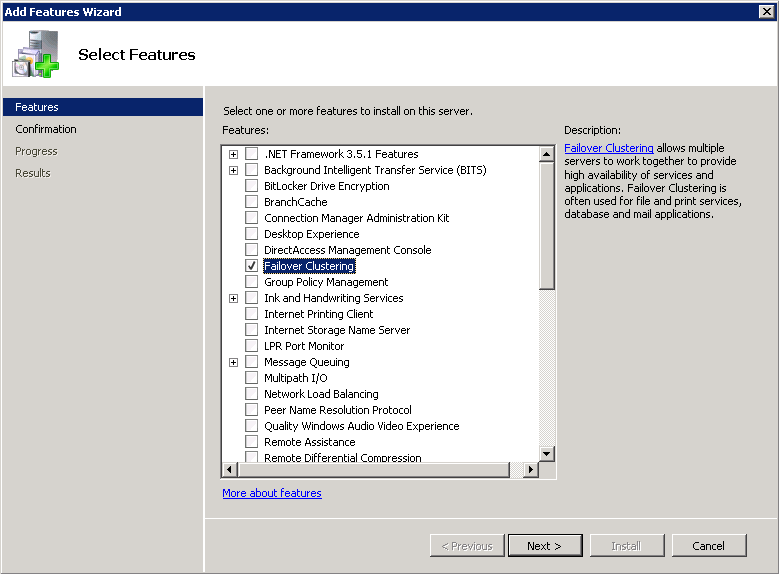 同時也能在 active directory users and computers 下的 computers ou 看到一個名為 cl01 的電腦物件. 在每個節點伺服器上都有三片網卡, 一片是提供給一般使用者或管理者連線使用, 另一片則是保留給結點伺服器收發活動訊號使用, 最後一片則是僅供 iscsi 儲存裝置使用, 給 iscsi 儲存裝置使用的網卡我們不希望 cluster 使用他來做任何事情 (供使用者管理者存取, 收發活動訊號, 所以我們要限制 clustering 服務排除此片網卡. 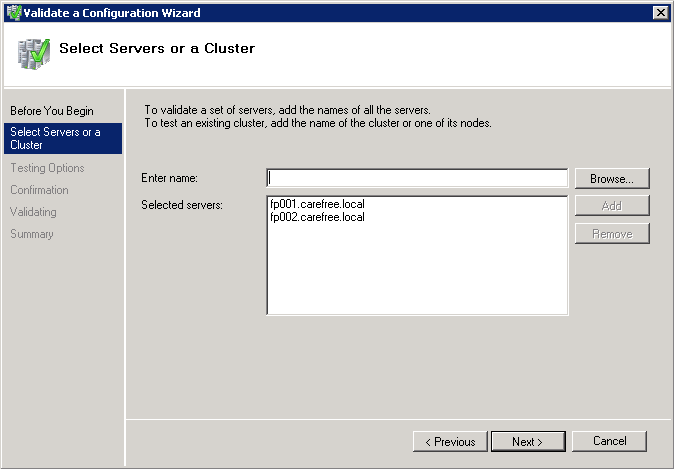 cluster network 1 : 從名稱很清楚的能夠識別所包含的網路卡是屬於 iscsi 儲存裝置. 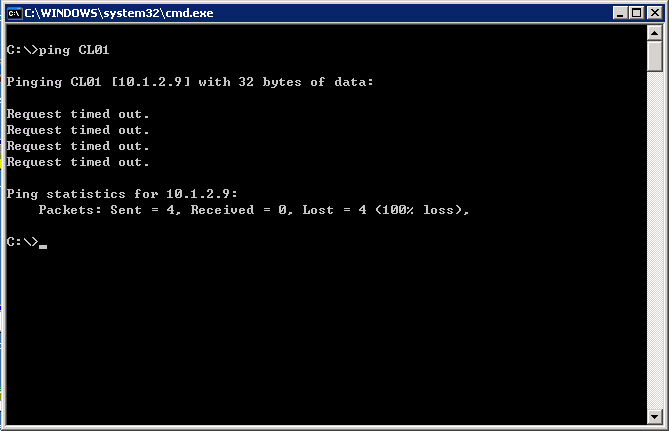 點選 do not allow cluster network communication on this network. 點 apply ,然後點 ok, 關閉內容頁. 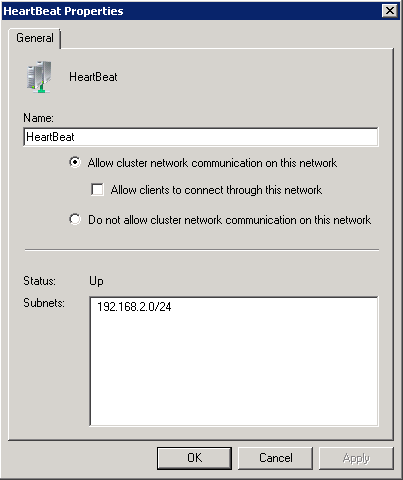 cluster network2 : 從名稱很清楚的能夠識別所包含的網路卡是屬於活動訊號 (heartbeat). 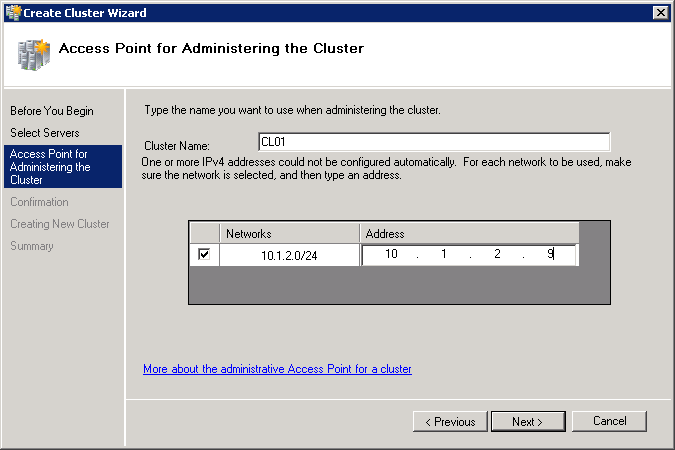 cluster network3 : 從名稱很清楚的能夠識別所包含的網路卡是屬於public, 也就是提供使用者與管理者存取的網路. 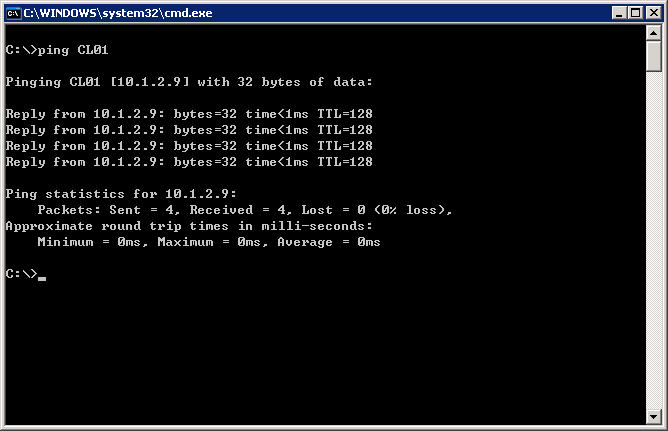 點選 allow cluster network communication on this network. 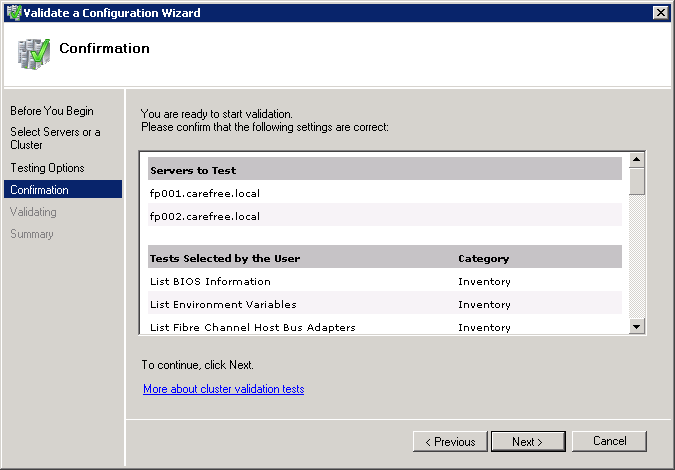 確定 [allow clients to connect through this network] 被選取. 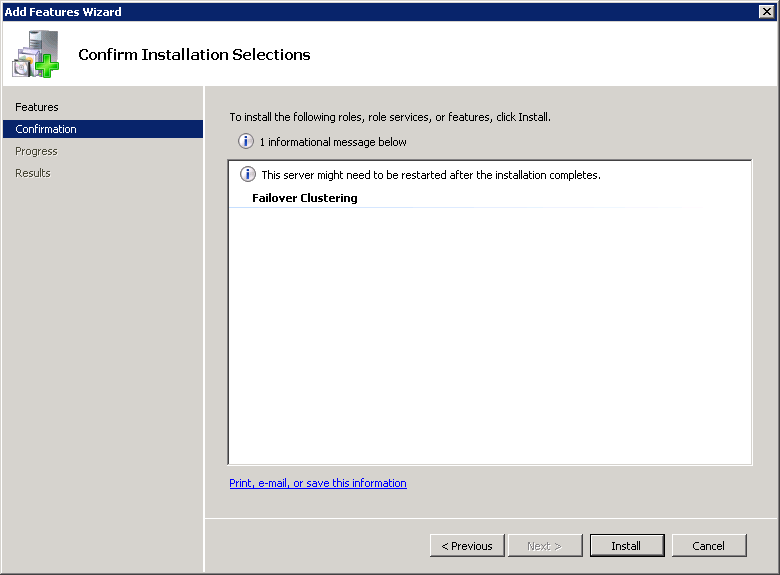 在完成網路設定後, 回到 failover cluster manger, 並點選一下 cl01 , 檢查一下目前的設定, 看起來似乎我們的叢集已經完成了. 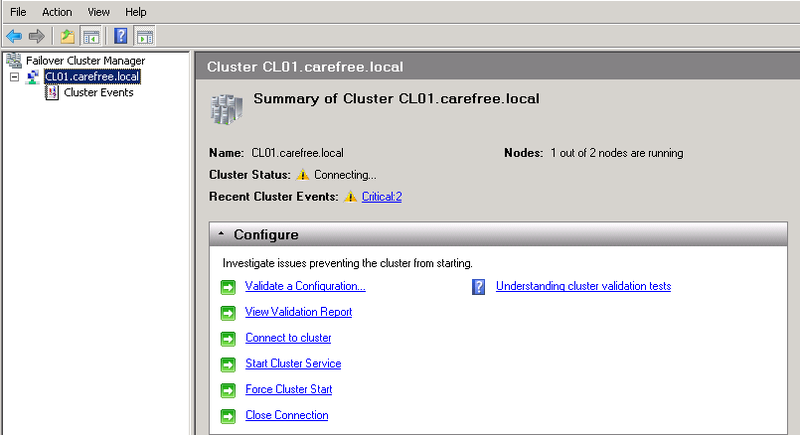 接下來我們使用工作站去 ping cl01 這個 cluster 存取點. 讓我們停止 fp002 (關機或者拔網路線都可以), 然後再 ping 一次 cl01. 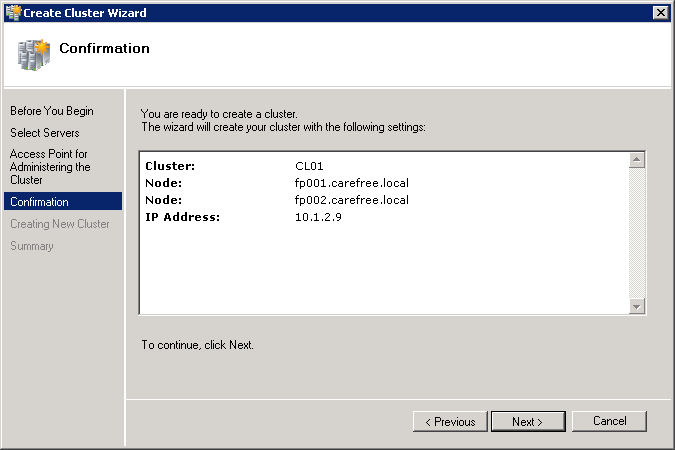 我們先啟動 fp002, 並開啟 failover cluster manager 檢查一下. 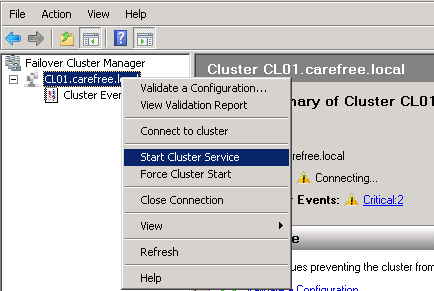 開啟 failover custer manger 後, 發現 cluster 服務呈現停止狀態. 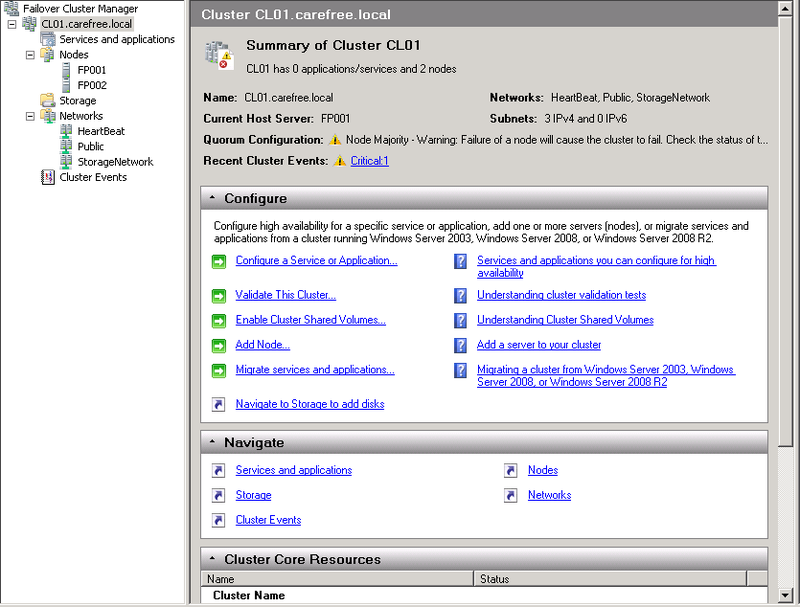 使用右鍵點一下 cl01 cluster, 選擇 "start cluster service". 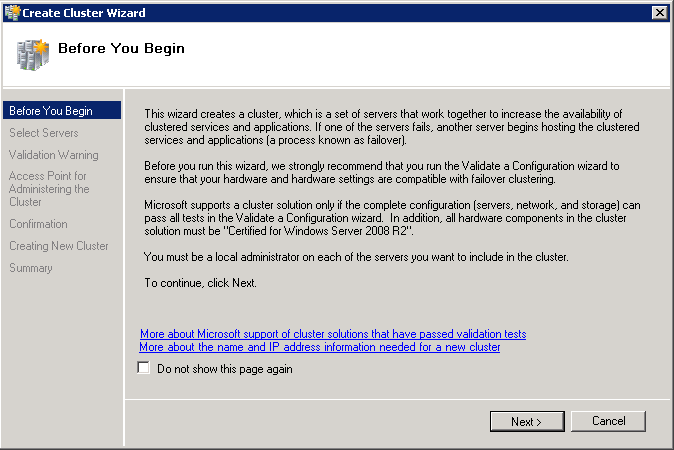 當 cluster 服務啟動以後, 從中間的資訊可以得知, 目前由於沒有仲裁磁碟機, 所以只要一個節點失敗, 將造成 cluster 服務停止. 由此可知要讓兩個節點的叢集具備容錯的能力, 仲裁磁碟機是必要的設定, 至於甚麼是仲裁磁碟機, 甚麼時候用上它, 下一章我們將有詳細的介紹.